Early last year, a stretch of historic retaining wall collapsed on the Overton Road at Ludford. There have been two-way lights in place since. The work to repair the wall will be more extensive than first thought and could take three months. The lights are therefore likely to be in place until the end of June. An application has been submitted for listed building consent to allow the work to go ahead. One of the most frequent questions I get is when the long collapsed wall at Ludford House is going to be repaired. The initial problem was that there was no money in the highways budget to pay for the repairs (the budget was cut by £5 million last April). Now the work is expected to start this April, at the beginning of the new financial year. It could take up to three months to complete and will be weather dependent. Final work schedules are not yet firmed up. 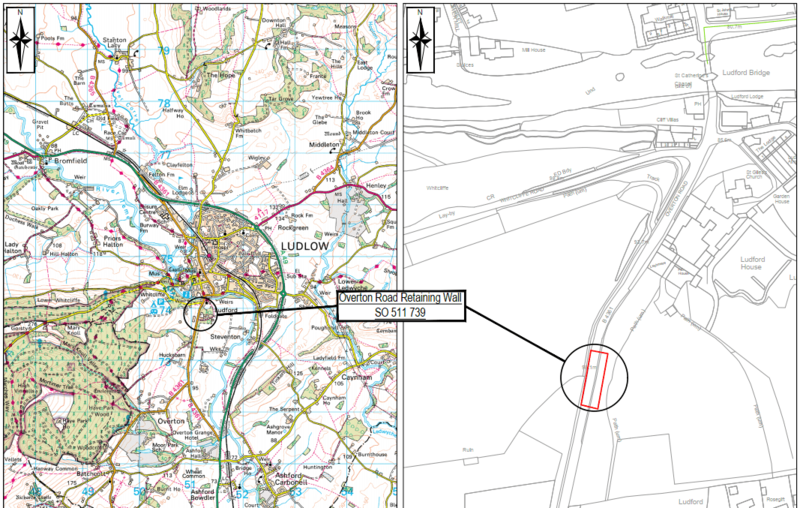 An application for listed building consent was submitted to Shropshire Council earlier in the month by the council’s highways consultants WSP (18/05791/LBC). This is essential as the wall is Grade II* listed as party of the curtilage of Ludford House. There are unlikely to be any objections to the work from consultees. The application was developed with Shropshire Council’s conservation team and Historic England said it does want to intervene. The consent may need to go to the South Planning Committee as the application is being made by the council but this will be a formality that should not delay the work. The 10-metre collapsed wall will be rebuilt by Shropshire Council’s highways contractor, Kier. During surveys for the repairs, a crack was discovered near the top of the wall. To fix this, 1.2 metres of the stonework at the top of the wall will be taken down and rebuilt over a stretch of 8 metres. The repairs will be made with existing stone and similar new stone sourced from Roy Mills Quarry. This quarry has supplied stone to repair the wall before. The bonding will be lime mortar, which is slow setting and does not set at all under 5C. To facilitate rebuilding, the bank behind the repair section will be cut back at 45 degrees. This may require removal or coppicing of some trees at the top of the wall. The consultants have concern about the health of a veteran tree above the collapsed section and are checking it out. Work on trees will be late in February before the nesting season. The wall on the other side of the road is also in poor condition. It has localised defects, including missing stone, spalled masonry faces, cracking and loss of mortar. Some sections of the wall are bulging or leaning, and ivy is attached to the face of the wall. The higher priority repairs for this 280-metre length of wall be carried out while the collapse is being repaired. Do the Council own the House ? Speaking of walls, I believe it’s now six years since the town wall collapsed in the churchyard during heavy rain. As nothing has been done in those six years I assume that like Brexit the repairs will never be started or finished!! Good to see that’s being done, but what about the town wall by St Lawrence’s? I don’t understand why if the wall is part of the curtilage of Ludford House, that Highways are paying for the work to be carried out?.